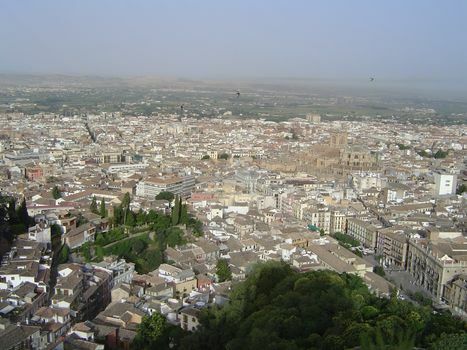 The Nazrid capital was Granada, and the Alhambra--a city overlooking a city--was their creation. It had deeper roots, going back to a ninth-century fortress, the al-Qalat al-Hamra or "red castle." This castle fell into disrepair before being rebuilt in 1050 by Samuel ibn Haghralla, the Jewish vizier of another dynasty, that of the Zirids. Under Muhammad I, the Nazrids began again on the site. 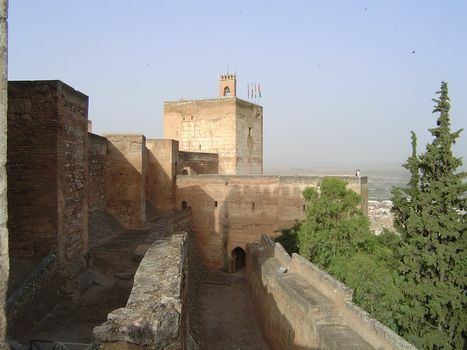 Their kingdom was a mere vestige of the Cordoban caliphate, and while the Alhambra's Alcazaba, or fortress, was built of stone, the palaces flanking it were built of wood and plaster. Construction continued through the reign of Mohammad V.
Mohammad XII, better known as Boabdil, relinquished the Alhambra to Ferdinand and Isabella in 1492. (This was the setting of the apocryphal remark attributed to his mother: "Do not weep like a woman for losing what you were unable to keep as a man.") He withdrew across Gibraltar and retired to Fez. 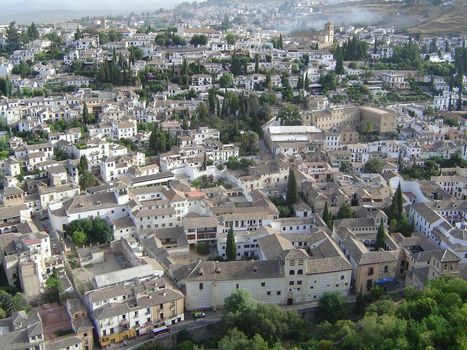 The Jews of Spain were expelled at the same time, but Granada remained a Muslim refuge. Perhaps 300,000 Muslims had settled here during the Nazrid period, and in 1492 they and their descendants thought that they would be well treated by the Christians now in control. They were wrong: in 1502 they were forced to convert to Christianity or leave the country. In 1609 even those who had converted, the Moriscos, were expelled. In 1515, Queen Joan declared the Alhambra a monument: her proclamation stated that it was to be preserved for all time. Preservation efforts in fact were minimal, but the Alhambra remained in royal hands until Isabella II was deposed in 1868. Almost immediately, in 1870, it was designated a Spanish national monument. 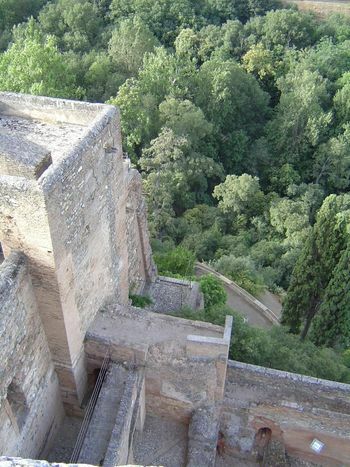 In this way a major part of the Alhambra survived, unlike the far grander city of Medina Azahara, near Cordoba. The Alhambra also came to play a major role in Europe's vision of the Orient. Dryden refers to it in "The Conquest of Granada" (1672), and Burke, writing about the beautiful and sublime, praised it for its irrationality. Chateaubriand and Victor Hugo wrote novels involving it, and a young American writer, Washington Irving, came in 1829 and found himself, in his own word, "spellbound" by the site. The Spanish were slower in their appreciation, but they caught up after publication of Jose Zorilla's Granada poems in 1852. Since then, the Alhambra has been an icon for the Spanish. Quite a change: writing in the 1830s, Richard Ford had said that the Grenadinos "despise the Alhambra as a casa de ratones, or rat's hole, which indeed they have made it." 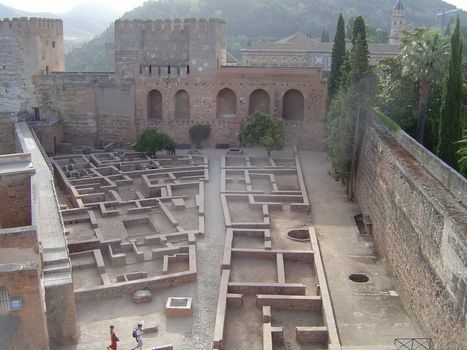 The Alhambra lies atop a narrow ridge and consists of three parts: a small town that catered to royal needs and which is now obliterated; the royal palaces, partially extant; and a fortress or Alcazaba at the tip of the ridge. Here we look over the fortress toward the tower at the end of the ridge. 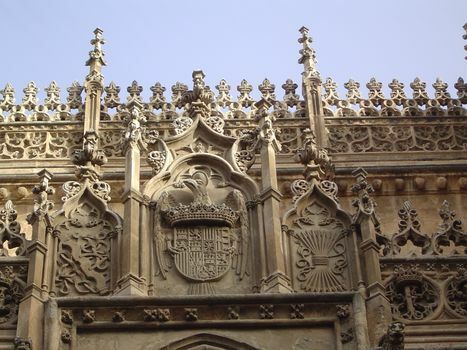 It was here that Ferdinand and Isabella in 1492 raised their flag and marked the end of Muslim power in Spain. The fortress is austere, as one might expect, and although it has a spectacular location is no more arresting than hundreds of other bastions. The Nazrid palaces are in the background, on the right. Looking the other way from the same vantage point, the site seems impregnable. This is the first of three pictures of the view from the Alhambra. 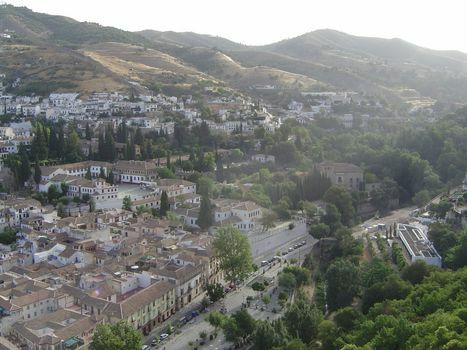 Here we look down the north slope of the ridge toward the district known as the Albaicin, where Granada began. The view hasn't changed much; we're looking straight down slope to get a sense of the courtyard houses at the bottom. Now we're looking down from the tip of the ridge to the modern city; in the center-right is the tawny cathedral, where Ferdinand and Isabella are buried. 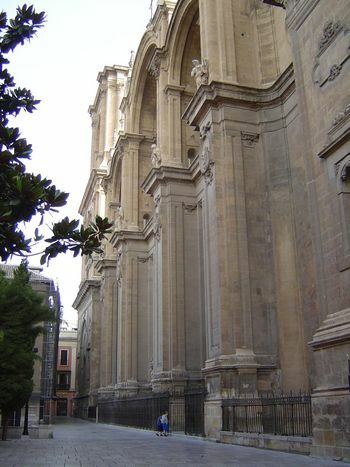 The cathedral from its entrance. 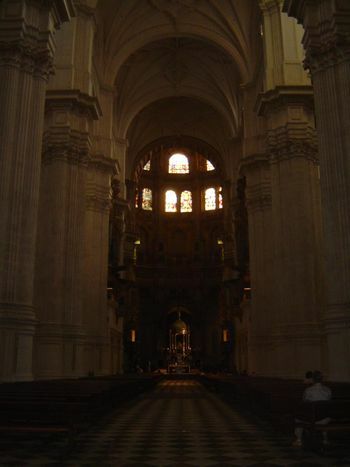 Inside, massive columns almost hide even more massive piers that carry the structure.